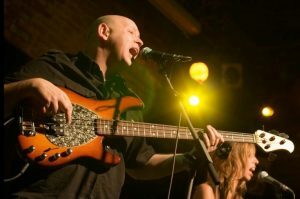 Electric and Bass Guitar Lessons in Southampton provided by Gary Blackman. Free taster lessons to all new students, no matter what your ability. Whether you need guitar lessons for beginners, or already have experience, we have the teacher for you. Call now on 023 8065 8373! Gary Blackman is our lead tutor and teacher and has had an extensive career in the music industry, spanning thirty two years and crossing performance and teaching aspects of the industry. He played Bass guitar as part of 80’s star Yazz backing band, as well as for Davey Jones from The Monkees and jazz legend Andy Sheppard. He also appeared with Gary Barnacle of Level 42/Paul McCartney and supported ska band giants Bad Manners. Gary connects well with students within a wide range of ages and abilities, from beginners through to intermediate and advanced, building confidence and enjoyment in the guitar. He is extremely passionate about music and has the ability to communicate this to others, inspiring them to learn more. As the south coast’s premier recording studio and music facility, we have built up an outstanding local reputation for music tuition across a wide range of disciplines. Your lessons will take place at our Totton studio, which has state of the art technology, acoustic treatment, live rooms, guitar cabinets, and vocal booths spread over two floors in a professional music complex. When you choose us as your Southampton guitar teacher, you will benefit from Gary’s years of experience and industry knowledge, all packaged into fun and informative lessons no matter what your age or ability. Each lesson will take you one step closer to being the strong and confident guitarist that you have the capability to be. In fact, we’ve seen children, adults, and even older people leave us to go on and have exciting careers in the music industry. Even if you aren’t looking to become a professional, our lessons are still designed to take your skills to the next level, even if it’s just a hobby you want to take up with no ambition on becoming too serious! Our guitar lessons in Southampton have been structured and planned to suit you as an individual, guaranteeing you progress at your own pace. If you are unsure whether guitar lessons are for you, then we are currently offering a no obligation free taster session. We genuinely believe that anyone can play the guitar providing they have an expert teacher and guidance. It’s never too late to start, and we offer guitar lessons for beginners in Southampton and can also teach children, including bass and electric guitar tuition. To get started, get in touch with us today and have a chat with a member of our friendly team to see how you can get started. Many of those who learn with us will be complete beginners of any age. Our lessons are perfect if you have just picked up a guitar for the first time. During the tuition you will be taught how to play chords, the basics of guitar techniques, tuning up, tablature, strumming, finger-picking, how to read a little bit of music, and lot more at your own pace – all wrapped up in fun and engaging lessons with our expert teacher. All of our lessons are based on bass and electric guitars. You will need your own guitar when booking with us, however if it’s just a free taster you want to book, then we can supply you with an instrument. Gary can then even help and advise you on what the right electric guitar will be for you if you decide to commit to further lessons. You can see our prices further up the page. All lessons are either 30 minutes or one hour long and can be booked for a date that’s convenient to you. Our teachers offer tuition up to 9pm in the evenings, so even if you have work or family commitments, you should be able to book a slot that suits. Whether you do decide to just book a one-off lesson or in a block, you will still get exactly the same quality and attention. To book your fun and supportive lesson, or take advantage of a free taster session, use the booking system further up the page. Alternatively, feel free to call us on 023 8065 8373 with any questions you might have! We also offer Bass guitar lessons in Southampton, Singing lessons for beginners and Music Production lessons at River Studios.